Finding time for a break is near impossible as owner of the TT but I was determined to have a few days off after a busy summer so Rachel and I escaped to France in October. No fixed itinerary was made apart from to eat, drink and explore the treats of Provence. The region is famous for its seasonal approach to cooking, the distinctive flavour of Herbes du Provence, delicate rose wines and the bold Cotes du Rhone reds. The region champions its local produce and every day in a different small town we parked our car, walked through sleepy streets to find a bustling vibrant market place bursting with colourful stalls. Animated sellers tempt you with samples of artisan breads and every conceivable flavour of cheese, salamis and olives you could wish for. Of course, the markets are popular with tourists but with the friendly chatter and joking exchanges it is obvious these markets are used by locals. I guess it is all too easy to go to the supermarket back home but perhaps we should follow this example of supporting our local producers more. We had great fun, bought far too much food and enjoyed the friendly atmosphere. At one market a small stall caught my eye, compared to the rest it wasn’t laden with colour; there was just 1 jam jar on show containing, in my opinion, one of the most delicious but mysterious and elusive delicacies – a black truffle. 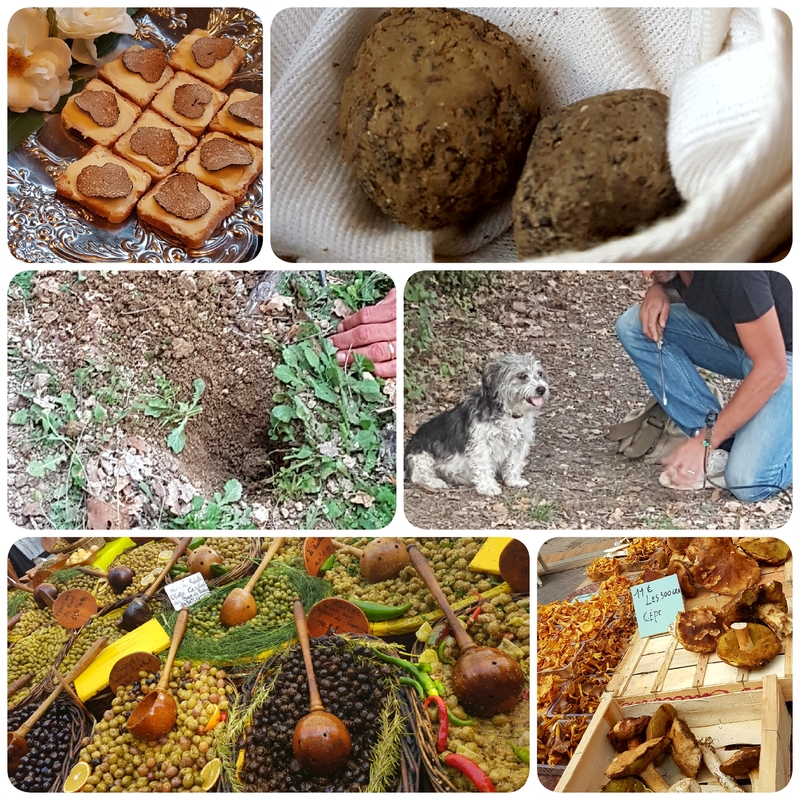 Whilst savouring the distinctive smell and chatting to the proud stall owner we signed up to go truffle hunting the next day. Strict instruction was given to not ask any locals for direction if we got lost. You may think why?.... but with a value of £1000 a kilo it’s not something you want the locals to help themselves to! Truffles grow from spores on the roots of certain oak and hazelnut trees. There is a complex symbiotic relationship between the roots, tree and weather conditions, pH of the soil and cultivating them takes time, patience and is often not successful. Once grown though there is the further problem of finding them! This was where the talents of the farm’s 2 trained dogs were shown to us. They were able to sniff out the prized truffle in minutes, dig it out of the ground and pass to their owner to receive their reward – they much preferred sausage to truffle! After an hour armed with our bounty we headed to the farm. Our host simply sliced the truffles and served with bread, butter and salt – quite simply I was in heaven. We do have our own OMG fries at the TT – skinny fries with parmesan and truffle oil, a firm favourite with many diners. Keep an eye out though, rested and inspired there may be a special dish soon with a little surprise on it!